South India (comprised of Kerala, Karnataka, Andhra Pradesh, Telangana and Tamil Nadu) really has a distinct culture that sets it apart from the rest of the country. Not only that, each state has managed to retain its own distinct identity. Intricate temple architecture, historical ruins, palm fringed canals, spirituality and beach will provide you with a varied and interesting trip. This article highlights the top tourist places to visit in south India. There are so many great destinations that it's difficult to select only a few! One of India's top historical destinations, the laid back village of Hampi was once the last capital of Vijayanagar, one of the greatest Hindu empires in India's history. It has some extremely captivating ruins, intriguingly intermingled with large boulders that rear up all over the landscape. The ruins, which date back to the 14th century, stretch for just over 25 kilometers (10 miles) and comprise more than 500 monuments. An incredible energy can be felt at this ancient place. Hampi is commonly visited from Goa, as there are a number of transport options from there. The heritage sites of Badami (formerly Vatapi), Aihole and Pattadakal are a worthwhile side trip from Hampi. They're rich in monuments, temples and ruins from the Chalukya empire, which ruled there between the 4th to 8th centuries. The renowned Chalukya style of architecture originated in Aihole and the village is filled with around 125 stone temples, which unfortunately don't get the attention they deserve. 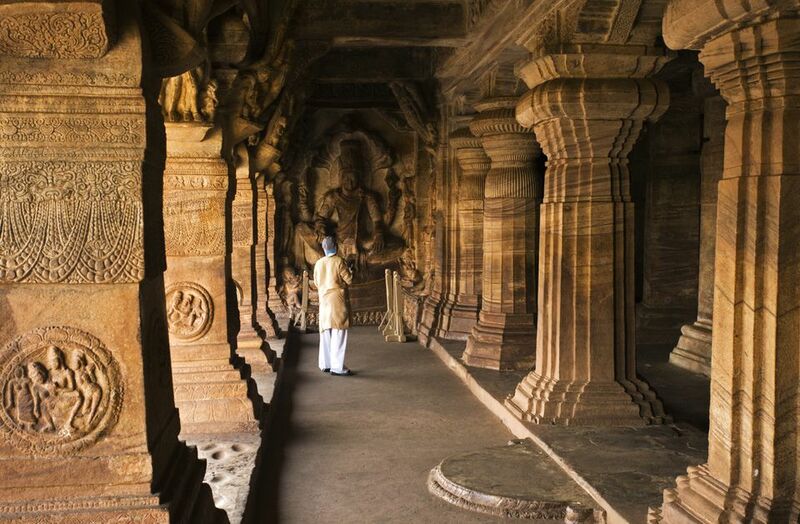 Badami is one of the top places to see caves in India, with four sets of magnificent ancient rock-cut cave temples. Pattadakal is smaller, with one impressive temple complex. Cruising along the palm-fringed Kerala canals, known as the backwaters, is a quintessential experience during which time truly seems to stand still. Indian food cooked by a chef and chilled beer on board the boat make it even more enjoyable. You can spend the night on the boat, out in the middle of the water, surrounded by serenity. Bliss! And while you're in the area, why not stay a night or two at a resort or homestay on the backwaters? You'll be able to feast on freshly caught and prepared seafood, according to traditional recipes. The fairy tale setting of Varkala beach is enough to take your breath away, with a long winding stretch of cliff and views that extend over the Arabian Sea. A paved footpath runs along the length of the cliff, bordered by coconut palms, quaint shops, beach shacks, hotels, and guest houses. Nestled at the bottom of the cliff is a sparkling beach, reached by steps leading down from the cliff top. It's not surprising that Varkala is one of India's best beaches. If you're there during late March/early April, try and catch a temple festival. Known as the "Gateway to Kerala", Kochi is an enchanting city that's had an eclectic influence. The Arabs, British, Dutch, Chinese, and Portuguese have all left their mark on the city. Most people recognize Kochi from pictures of the famous Chinese fishing nets that line the waterfront. Fort Kochi is full of architecture and historical sites, and is a marvelous place to stroll around and explore on foot. You can also catch a Kathakali dance performance and get an Ayurvedic treatment. Ancient Madurai is home to the most impressive and important temple in south India, the Meenakshi Temple. If you only see one south Indian temple, this temple should be it! ﻿The city of Madurai is more than 4,000 years old, and has remained a major center for Tamil culture and learning. The old traditional part of the city is fascinating to explore on foot. These days, Madurai attracts pilgrims and tourists in equal numbers. The 12 day Chithirai Festival, featuring a re-enacted celestial wedding of God and Goddess, is held in Madurai during April each year. Pondicherry was a former 18th century French colony and remains a separate union territory on the east cost of Tamil Nadu. It retains a distinctly French flavor and provides a delightful break. Wander around the atmospheric French Quarter and along the Promenade, soak up the peaceful atmosphere, dine in delicious restaurants, and browse the boutiques. Sri Aurobindo Ashram attracts plenty of spiritual seekers. Auroville is a popular day trip. Mahabalipuram (also known as Mamallapuram) is a beach town with a thriving backpacker and surfing scene, an hour away from Chennai. It's also renowned for its stone sculpture industry, so keep some money aside to shop! Other attractions are the Shore Temple, Five Rathas (temples sculptured in the shape of chariots), and Arjuna's Penance (a huge carving on the face of a rock depicting scenes from the Mahabharata). A classical dance festival happens there every year from late December to late January. Rameshwaram is a peaceful little pilgrim town in southern Tamil Nadu, brought to life by the constant stream of pious people that come to bathe in its holy water, get a puja done to purify their karma, and visit Ramanathaswamy Temple. The town and temple are tied to the Hindu epic the Ramayana. This is where Lord Ram got Lord Hanuman to build a bridge across the ocean to rescue Sita from her abductor, Ravan. Adam's Bridge (also referred to as Ram Setu), a chain of reefs and sandbanks, is said to be the place where the bridge was located. It's about as remote as you can get, and almost connects India with Sri Lanka, only around 30 kilometers away. In this area, not far from Rameshwaram, are the eerily crumbled and windswept remnants of Dhanuskodi, a town destroyed by cyclone in 1964. The approach to Rameshwaram is dramatic, with two long bridges (one for trains and one for other vehicles) linking it to the mainland. Mysore has an impressive royal heritage, with the city's main tourist attraction being the imposing Mysore Palace. There are many other interesting buildings, palaces, and temples to see. Its zoo is one of the best in India. Mysore is also an excellent place to shop for sandalwood, and study Ashtanga yoga. For fresh aromatic of south Indian coffee and stunning scenic beauty, head to Karnataka's Kodagu region (often referred to as Coorg, the English version of its name). This picturesque and alluring mountainous area in southern Karnataka, not far from Bangalore and Mysore, is renowned for its plentiful coffee estates. And, you can stay on one! The magnificent Golden Temple, one of the top Buddhist monasteries in India, is not to be missed as well. The Nilgiri Mountain Railway toy train chugs its way up to the popular hill station of Ooty in Tamil Nadu. The historic railway line was completed in 1899, 45 years after the first plans were drawn up. It was declared a UNESCO World Heritage site in 2005. The 46 kilometer (28.5 mile) journey is a picturesque one. It passes through rocky terrain, ravings, forested hills, tea plantations, 16 tunnels, and over 250 bridges (including 32 major ones). Ooty is a great place to escape the heat and nearby Coonoor is world famous for its tea. It's one of the top destinations for tea tourism in India.